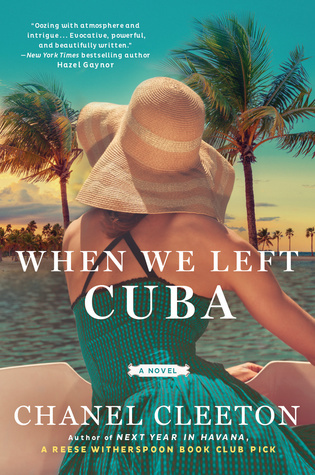 Goodreads says, "In 1960s Florida, a young Cuban exile will risk her life--and heart--to take back her country in this exhilarating historical novel from the author of Next Year in Havana, a Reese Witherspoon Book Club pick. Beautiful. Daring. Deadly. The Cuban Revolution took everything from sugar heiress Beatriz Perez--her family, her people, her country. Recruited by the CIA to infiltrate Fidel Castro's inner circle and pulled into the dangerous world of espionage, Beatriz is consumed by her quest for revenge and her desire to reclaim the life she lost. As the Cold War swells like a hurricane over the shores of the Florida Strait, Beatriz is caught between the clash of Cuban American politics and the perils of a forbidden affair with a powerful man driven by ambitions of his own. When the ever-changing tides of history threaten everything she has fought for, she must make a choice between her past and future--but the wrong move could cost Beatriz everything--not just the island she loves, but also the man who has stolen her heart... "
I love the sound of this one and look at that cover! Can I transport myself there? I haven't read Cleeton's Next Year in Havana yet, but I really want to. Have you read it? Let me know your thoughts and if you'll be adding this book to your TBR list. That cover is everything! So summery! I know, right? We had snow here in PA this week, so that cover looks especially nice! Thanks for dropping by! This doesn't sound like my normal read, but it sounds really good. I'll have to check it out. Hope you have a great week! Thanks, Sandy! I'm glad you agree. Thanks for visiting. I saw this on First to Read this week. And man, as cold as I am right now, that setting looks super inviting! I know, right? I think they did a great job with the cover. Thanks for dropping by, Barb.